Successfully Added Wide Angle Digital Camera - x4.8 Optical Zoom + 6M Resolution to your Shopping Cart. High quality digital camera, with a wide angle lens, optical zoom of x4.8 as well as x8 digital zoom, and high resolution of 6 mega pixels as well as the ability to take 10 mega pixel pictures through interpolation. 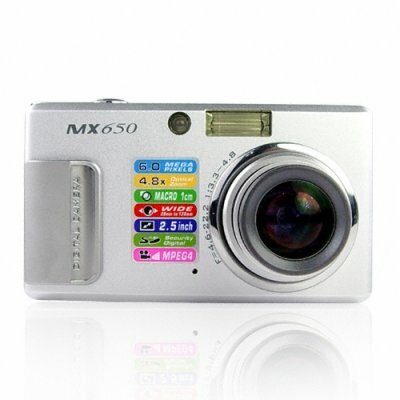 This professional grade camera also has such outstanding features as a MPEG-4 video clip recorder at 30fps with sound, super macro focusing, auto picture modes for help getting the best possible picture in many varied locations, digitally insertable frames for cute pictures, selectable pictures effects such as black and white or negative, and so many other fun options to play with. At its incredibly low wholesale price, this is a digital camera worth taking a long hard look at if you are in the market for a unique and excellent digital camera..